Growing up as a girl in today’s world is no easy task. Juggling family, friends, romantic relationships, social interests and school…sometimes it feels like you might need to be a superhero to get through it all! But really, all you need is little information. And as an added bonus, Girling Up is chock-full of charts, graphs and illustrations -- all designed in a soft gray to set them apart from the main text and make them easy to find and read. What worked: Encouraging info for girls on growing up. Mayim is like that cool older sis that tells you what to expect with your changing body without being preachy. This book's contents are broken down by such topics as how our bodies work; how we grow; how we learn; how we love; how we cope; and how we matter. Each chapter addresses topics that might be hard for some teens to ask adults about. Mayim shows a holistic approach to these topics and I totally love how she's nonjudgmental. Seriously, where was this book when I was a teen? 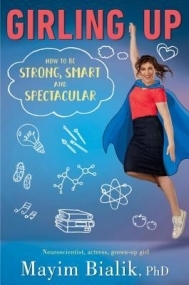 Mayim approaches sensitive topics in a way that is empowering by breaking down some common myths. One huge one is on that 'time of month' protection. How I wished she'd helped me through what was an embarrassing topic. See, Mayim is able to take such a topic and address it by showing the scientific part of how a girl's body works and then gives her take on it. No judgement. Just the info and suggestions to help make an embarrassing situation not so bad. Encouraging book that addresses issues on growing up without being preachy. Sure to appeal to those teens that have questions about their changing bodies without the fear of being preached to.